Even if those pics exist, how do they possibly end up on the web so fast?! The guy scanned em or something? I guess that sorta similar girls uploading revealing pics to facebook, etc. No idea of the risks and where those pics may end up. 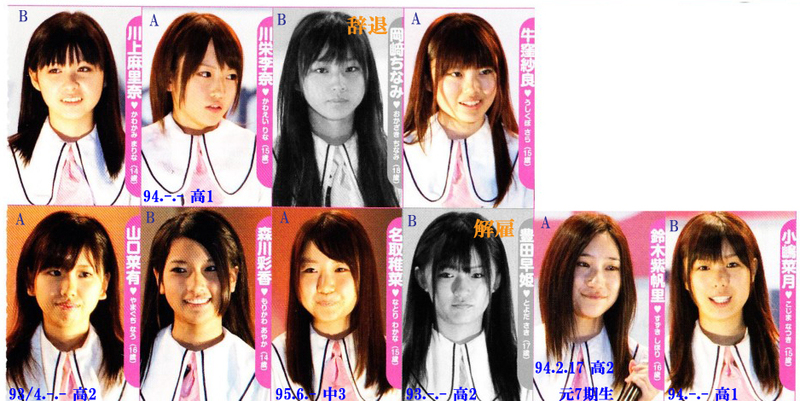 I don't have an insta-favorite out of this 11th gen. Before I was quick on the Nakamata Shiori bandwagon, but these... hmmm, I dunno. I'm not on the Shihori bandwagon too much. To be honest, even though the old Team B was my focal point from their formation to B4, I had forgotten all about her until I read one of Barrie's posts. Maybe I will watch her, she seems interesting. The only other one I get a vibe from is the top left one and her vampire teeth. She could be interesting. But I will definitely keep an open mind. If you told me in the past that I'd grow to love Haruu and RanRan, I'd laugh. and Saki is outta here That was fast..
Okazaki Chinami resigned... no specific reason is mentioned at this point. edit: ahw, it's Anariel's fav.. It's like a flashback to the 8th gen already. How many are gonna last until they even get to appear on stage?! Ah well. They would have had nearly 30 kenkyuusei at this point, which seems WAY too much, especially considering it's unlikely any other girls are gonna graduate soon, and certainly not in huge numbers like what got all the 7th gen promoted. @sousora I've heard that Komari has subbed for miichan, is this true? Page created in 0.529 seconds with 14 queries.